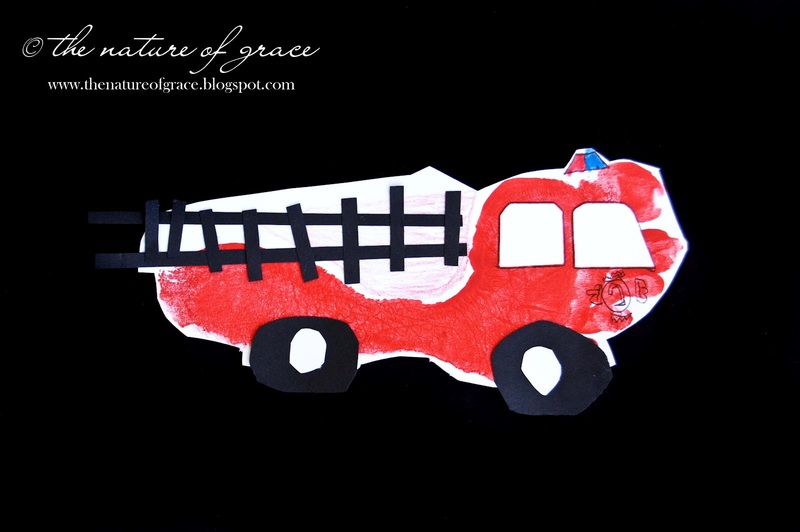 The Nature of Grace: Lesson Theme: Fire Station and Firefighters! Lesson Theme: Fire Station and Firefighters! I titled this game: Ready...Set...Dress. It could be played together as a timed contest or individually. The goal is to keep rolling a couple of dice until the two numbers add up to the number on the dressing list. The item beside the number is the piece of clothing the firefighter can put on next. 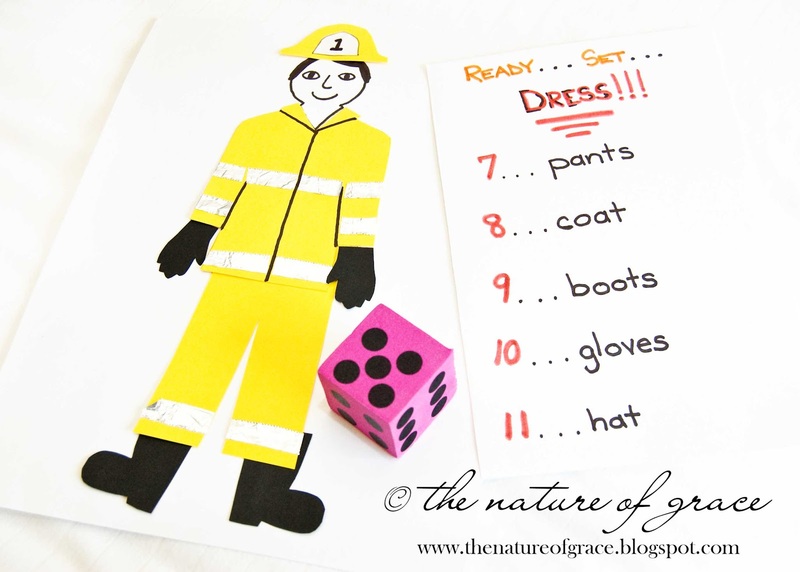 The game is done when the firefighter is dressed and ready to go! 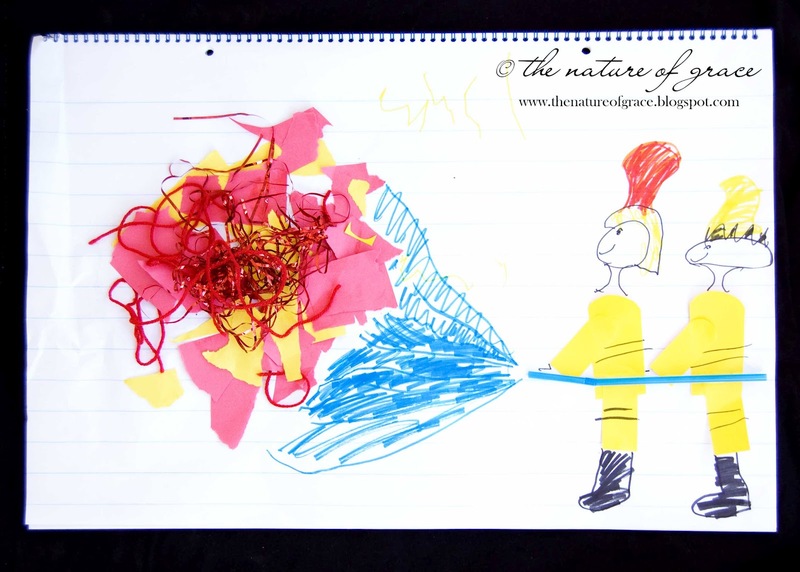 The pieces of clothing were items I drew on colored paper and cut out. The reflective stripes were made from aluminum foil. Uh oh! Time to fight some fires of our own! Miss A would roll two dice, write a number sentence about the numbers she had rolled, and answer the number problem. The answer was how many dots of water we were allowed to "spray" on the fire to put it out. It took quite a few dots but eventually our fire was extinguished! What a hit! 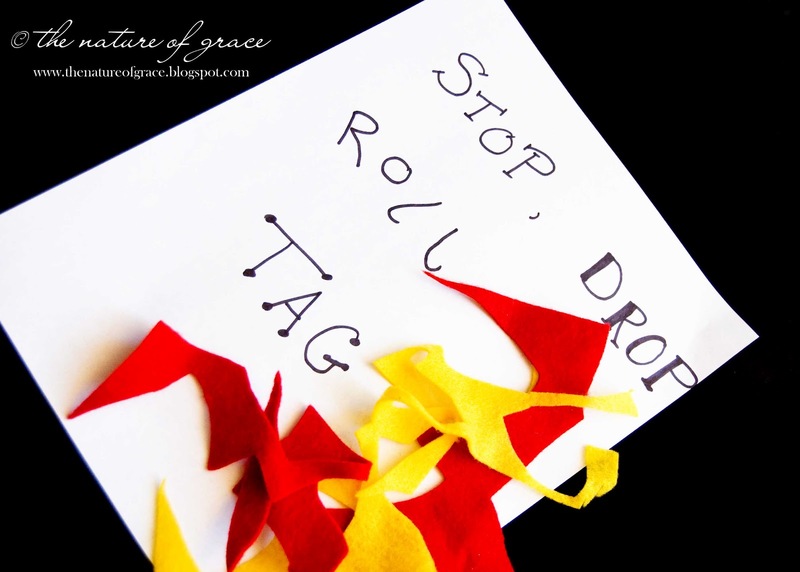 You can do so many things with this concept - have your kids practice writing their spelling words on the tablecloth, math facts, etc. 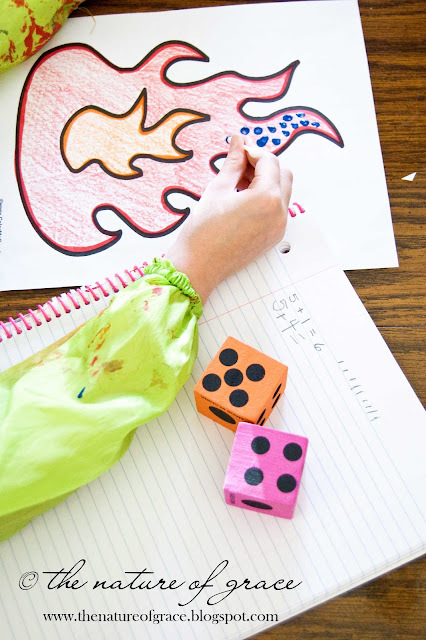 using red and orange markers to create the "fires". 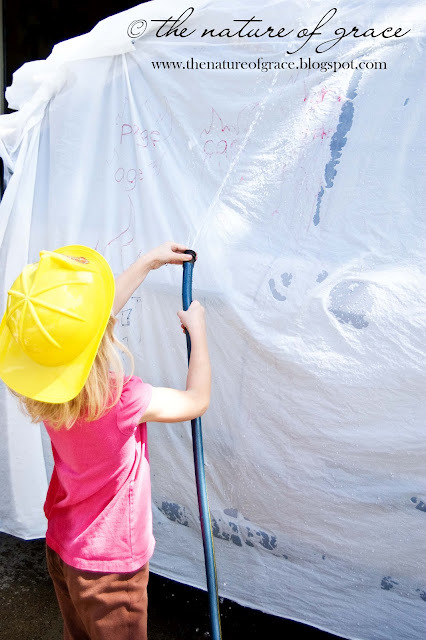 Then at the end of the lesson, they get to "put out" the fires with real water (just make sure you use a WASHABLE red marker or your fires might resist the water). 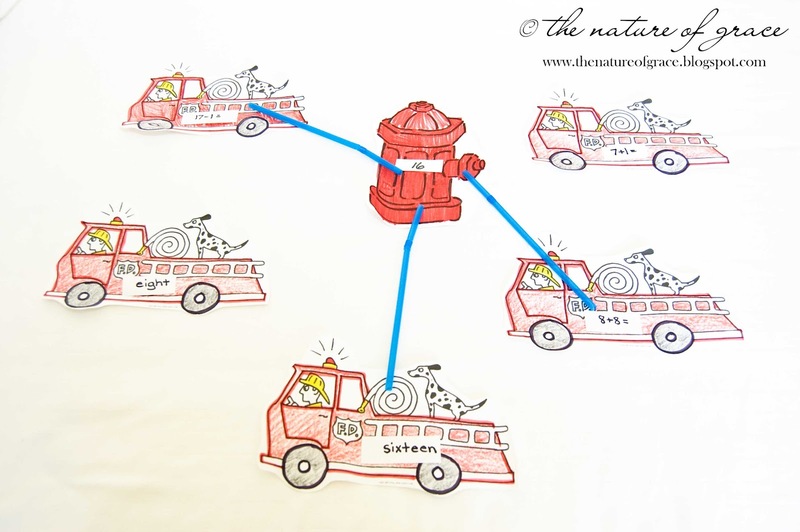 For this activity, I printed some fire engines and hydrants which Miss A and I colored. I cut them out and also snipped out some small words, number sentences, etc. On the hydrant, I would place the "answer" to some of the math sentences, words, etc. and each fire engine would have a "problem/question". If the answer on the hydrant matched the problem/question on the fire engine, the engine could hook up to the fire hydrant via a hose (blue bendy straw). If the engine could not match up with the hydrant's answer, they could not hook up to get water. 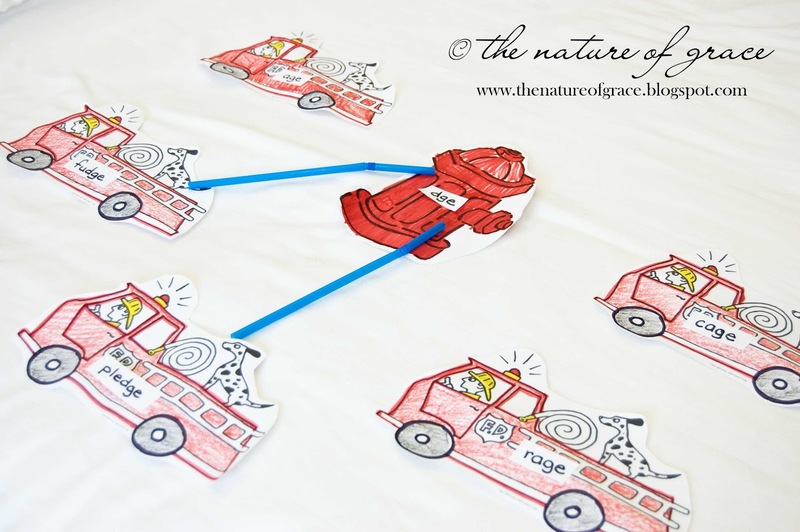 For example: if the hydrant had the word "rage" on it and you were practicing rhyming words, an engine would have to have a word on it that rhymed with "rage" in order to hook up its hose to the hydrant. 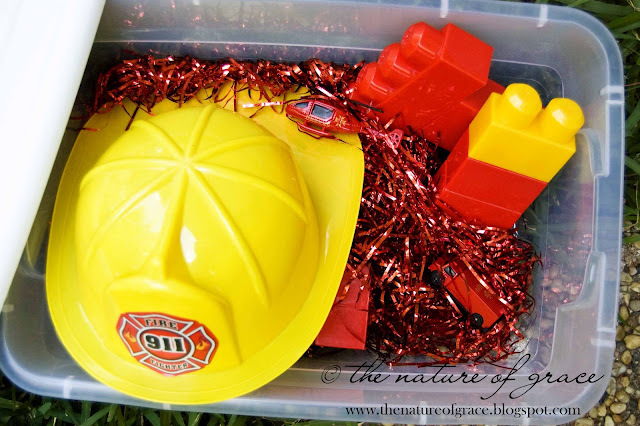 A pretend play bin fit for little firefighters (I found the hats at the 99 cent store or Dollar Tree - I cannot remember which). I saw this idea on Pinterest (here is a link) and thought it was soooo cute! I loved the idea of making my kids' footprints into fire engines! They helped of course. And when one has a fire engine, one should certainly have a fire station in which to put said engine. Thus, we built a fire station by rolling some dice, adding the numbers together and then using the answer to figure out what we would get in order to build our station (example: roll two numbers which added together equal seven = building). Sometimes we would just have to hold onto an item until we had another one on which to put it (example: holding onto windows until you have rolled a building). 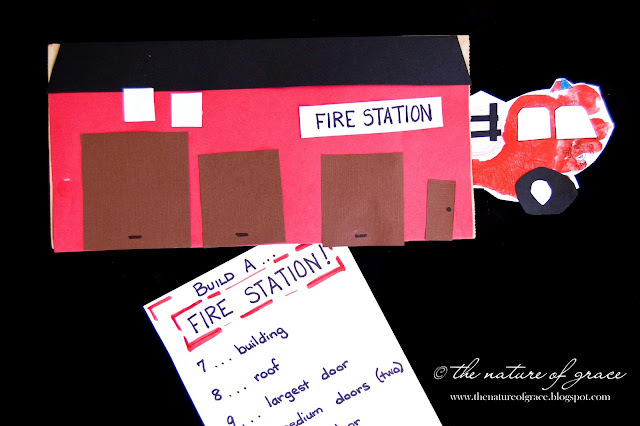 We then glued the items on a paper bag (one end is open so you can slip your fire engine in and out as you please - see picture above). This is a fire collage that the kids worked on together - torn paper, red and shiny gift basket shreds, etc. This is such a cute lesson!!! I love your roll a firefighter, and the foot art is genious!!! I am soooo amazed by your continuing creativity and knack for making learning fun!! My daughter is going to love some of these activities... fire safety lesson here we come!! Just posted on Craft Gossip!! Thanks for submitting and keep creating!! Looks like a lot of fun! I like the idea of the activity about putting the fire out. My girls would really like that one. Le Chef Petite: Smores Crumble!